Today & yesterday I have done nothing to my spread bets. Actually that is a lie, let me re-phrase. I have placed no new trades over the last two days. I have adjusted a few stops where necessary but I have done nothing else. I looked for new trades but nothing that matches my entry criteria so I’m playing the waiting game. I did contemplate pyramiding my existing Misys position yesterday and today as it has pulled back slightly from a high of almost 400p. I resisted as I’m not convinced the pull back is completely over. This got me thinking about when to pyramid existing positions and I think I may have a rather unique solution. “What’s that then?” I hear you ask. Well I’m not telling, it’s top secret. Hang on a sec that doesn’t sound like me. The whole point of this website is to share information. Ok then, you twisted my arm. I’ll tell. 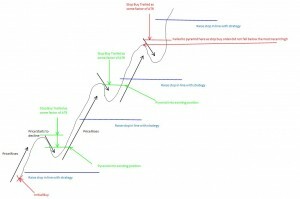 When I buy into a stock and it trends upwards I trail my stop as the price rises. But what if when the price starts to re-trace I was to trail another stop to buy in again when the price starts to rise again. Sounds a bit complicated so I’ll do my best to explain further. If you still don’t get it please e-mail me and I’ll try to do better. I’ve done a little sketch to help try and explain things further. So here goes. We buy into an instrument at the red X (Initial buy). The price rises and we raise stops inline with our strategy. 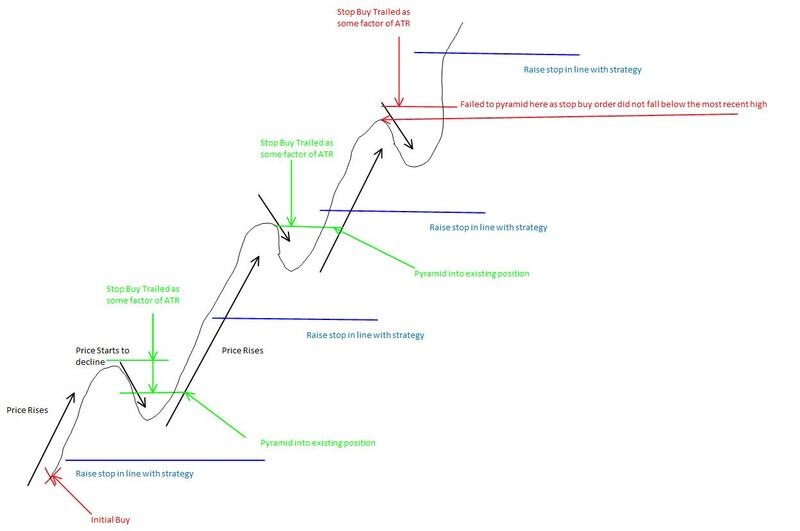 When the price starts to fall back, retrace, dip or whatever you want to call it we mentally trail the price with a new buy order. This buy order would be trailed at some factor of ATR away from the price. If this new buy order hits a price that is less than or equal to the most recent high then we place this order with the spread betting firm, bearing in mind this will need to be updated daily from now on. If the price continues to fall and hits our stop then we exit the trade and cancel all associated orders. If however, the price starts to rise again our new buy order will be hit and we will have pyramided into the existing position. Then as the price rises we continue to raise our stops in line with our strategy. When the price dips again we do the same process as before. Mentally trail a new buy order at some factor of ATR until it falls below the most recent high. Once it’s below the most recent high we place an order to buy, manually updating this price if the price falls further. When prices start to rise again we pyramid into the position again and keep adjusting stops as necessary. If the price dips but our new buy price never falls below the most recent high then we leave it and do not pyramid the position at all. So there it is. What’s that “Clear as mud!”. Hopefully it makes sense. If not please get in touch either via e-mail, over on the spread betting forum or leave me a comment. It would be good to hear other people thoughts about this new idea of mine. Right that’s your lot for today. Hopefully there will be more trading soon, unfortunately it’s out of my hands. I just do what the markets tell me to do these days and I’m hoping I’ll get rewarded for doing it. Oh and just so we’re completely clear this is for educational purposes only. It’s not advice or a recommendation of any kind. Please see my disclaimer and risk warning for more information.